The Warwickshire quiz that everyone*’s talking about is back. 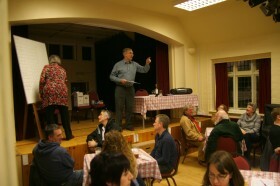 Quizmaster Beavan is again weaving his question-setting magic for the event, which will held on Saturday 16th March at the village hall, Barford. The entry fee is £8.50 per person, including a two course hot meal, and there is a licensed bar. The quiz is open to everyone and is an important fundraiser for the club. To enter a team (ideally of four) please contact Simon Drage on: 07851 122333 Email: simonxk8@hotmail.co.uk. If you;d like to come but can’t raise a team contact Simon anyway – he is an excellent match maker.